Last time we were here together we kissed inside the circular Olafur Eliasson installation on the second floor. Orange and you all around me. Tongues inside each other’s mouths, laughing out loud at our lust. Despite this version of elementalism requiring supplicant bodies to complete or form the work’s whole, we heckled these neat edges. Here again but this time down the road, I’m squinting to make fuzzy edges around clear sight and bright day. Dwyer’s oversized earring offers relief in a smirking. Glinty golden buckles hold the polyvalent mobile up high. Squint again. Squigy vessels hardened with golden abrasions crowd the window ledge. Balance. Weight and light-weight swinging together around a corner and shifting configurations make for looking and looking again. 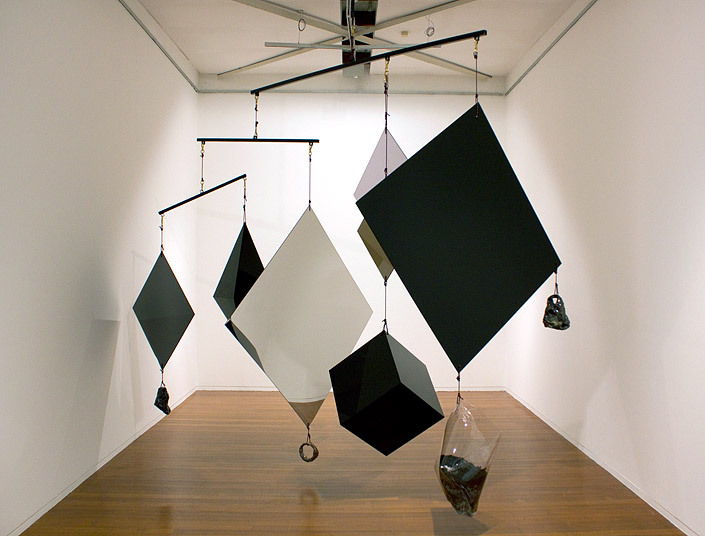 Geometric jewels formed from hard-edged Perspex planes. 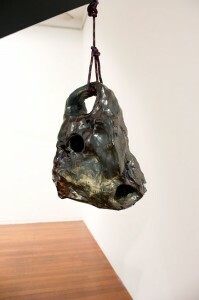 One droopy cast bronze plasmic handle is looped to the mobile via a noose. Curvaceous and constricted all at once. Contours and pertness in parts, resembling plasticine scrunched by a giant clenched fist. 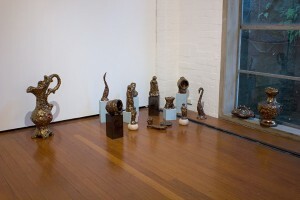 Mikala Dwyer, Divinations for the real things, Roslyn Oxley9 Gallery, Sydney, 23 June – 21 July 2012.